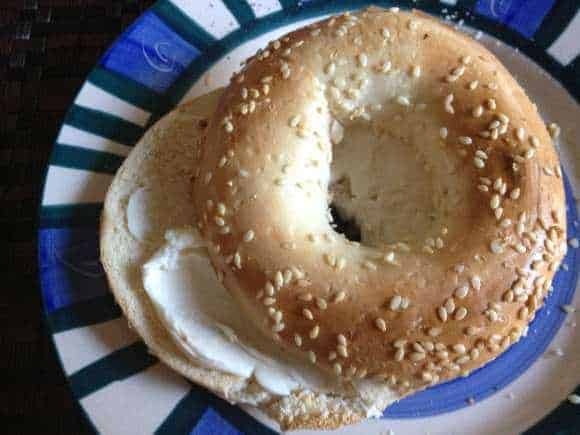 This post about easy healthy recipes for bagels contains affiliate links. As a proud Montrealer, Bagel is one of our favorite bread products! Tasty, crunchy or soft! Perfect for breakfast, dinner, appetizer or just plain! I usually get it from the bakery where I eat at least one fresh hot one as soon as I get in the car! It’s a guilty pleasure. They’re just so amazing fresh from the oven! 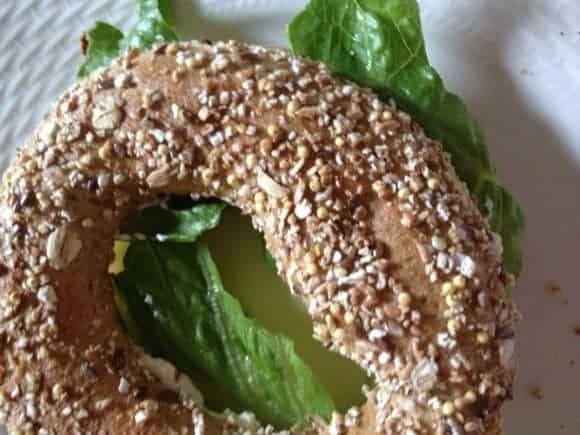 There are so many delicious easy healthy recipes to enjoy your bagel! How do I eat my bagel? Take a look at a few of my favorite ways! This is probably the most popular way to eat a bagel! It’s so easy and quick, you can make it on your way out the door. Even better, while it’s amazing toasted, it’s just as good without toasting. The great thing about cream cheese is that it comes in so many flavors now. Craving fruity? Go with the a strawberry swirl on a plain bagel. Want something savory? How about chives on an onion bagel? Maybe you don’t like cream cheese. Perhaps you are really in a rush and don’t want to take the time for that extra step. How about a bagel with just butter? This tastes best if you toast it first, so the butter can really melt into the bread! Like cream cheese, you can also mix things up a bit with butter. You could even get a Butters of the World Assortment and try something different every day! This is such a fun and easy recipe for kids! Voila! Add some fruit and you have a delicious healthy breakfast! Kids love it for breakfast on Saturday! It is nutritious and cute! If you’d like, you can even add a little cheese to the egg for extra taste. This one is perfect for lunch boxes! Add a slice of smoked salmon. 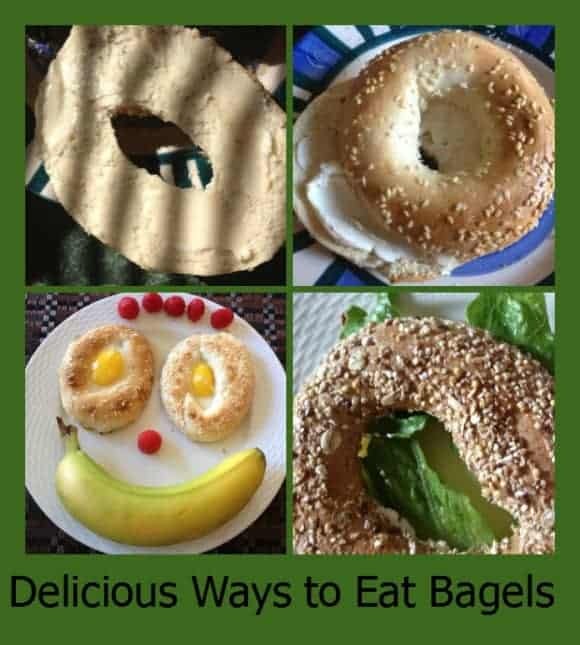 We hope you enjoyed these 4 delicious ways to eat bagels! Are you a bagel fan? What is your favorite way to eat them? Do you go for the fancy cream cheeses? The tasty butters? Egg and cheese? Something entirely unique? We want to hear from you! We are professional bagel eaters at our house, and have been eating ‘egg in the hole forever’. Have you ever tried making a grilled cheese with a bagel? Really good. We did and it is delicious!! 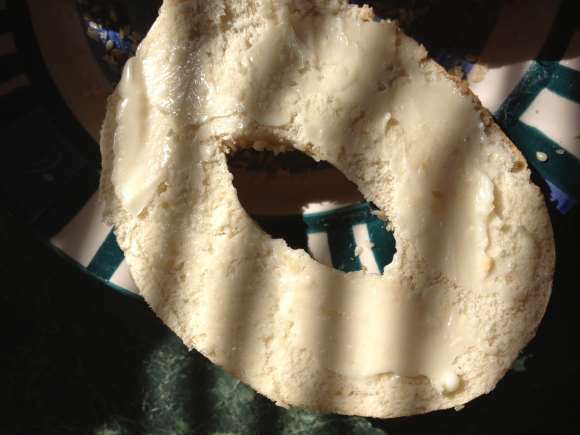 I love bagel with hummus these days… although I still do cream cheese on occasion too! 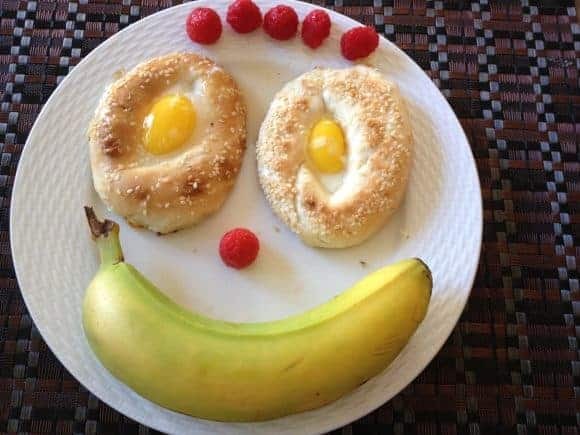 I bet my youngest would love those bagel eggs! with hummus! Perfection! I love it with an avocado spread! Yum now I am craving a bagel even more!! LOL looks like I need to run to the store! I agree, I never thought of adding an egg to a bagel, I am ready to try that right now! I love adding eggs to make eyes! Such a fun idea. LOVE the face one, my kids would love that! I like a bagel toasted w/ cream cheese and sliced onions on top! Thanks! My daughter loved and ate every bit! Now you have me craving bagels!!! I like mine with just butter on there. Mmmmmmm! I love eating bagels with cream cheese or the ones you can get from Chick fil a.
That’s one of my favorite ways of eating it too!! So good!